Use the Distribution page to preview how your skill will appear in the skill store and determine the skill's availability. Should Your Skill be Available Everywhere? Note that the above video refers to the "Publishing" tab. This is now the the "Distribution" page in the developer console. The metadata used in the skill store is language-specific. You need to fill in these fields for each language your skill supports. The data entered here is displayed on the skill detail page in the skill store. The name of the skill, displayed at the top of the detail card. A short description of the skill. A full description explaining the skill's core functionality and any prerequisites to using it (such as additional hardware, software, or accounts). This description is displayed in the Alexa app when users browse for skills. A description of the changes in this updated version of your skill. You can leave this blank for your initial skill version. Use this field to highlight new features or resolved issues. When you provide "what's new" text, your skill is shown in the Recently Updated section of the Alexa app and users can see your what's new information in the skill detail page. If you leave this field blank, your skill is not shown in the Recently Updated section. Three example phrases that illustrate how users can invoke your skill. View the Example Phrase 101 section for detailed help with creating your example phrases. For the custom model, these phrases must come directly from your sample utterances. For pre-built models, see the Example Phrase 101 section for valid utterances. An icon representing the skill. Provide both large and small versions. Small Icon: 108 X 108 PNG with transparency. Recommended 16px padding on all sides. Large Icon: 512 X 512 PNG with transparency. Recommended 75px padding on all sides. You can use the Alexa Skill Icon Builder to create your skill icon to these specifications. Within Icon Builder, click Download to save a zip file containing png files in both the small and large sizes. Then upload these .png files to your skill. Note that you cannot edit an existing icon in Icon Builder. You also cannot save the icon directly from Icon Builder to your skill – instead, download the files from Icon Builder and upload to your skill as noted above. An icon representing the skill. This version is displayed in the Alexa App on mobile devices for video skills. The icon should be 55 x 55 pixels. The category that best describes your skill. This helps customers find your skill quickly and easily. Simple search words that relate to or describe this skill. This helps customers find the skill quickly and easily. Use spaces or commas between each search term. Once you have entered all of the information for your detail card, be sure to open the Alexa app and preview the card. The app shows both published skills and your own skills currently in development, so you can see how your card will appear to users. You can enter the name of your skill in the search box to filter the list of skills. In the following image, the utterances shown under "Try Saying" are the example phrases. The description shown under "About this Skill" is the full skill description. 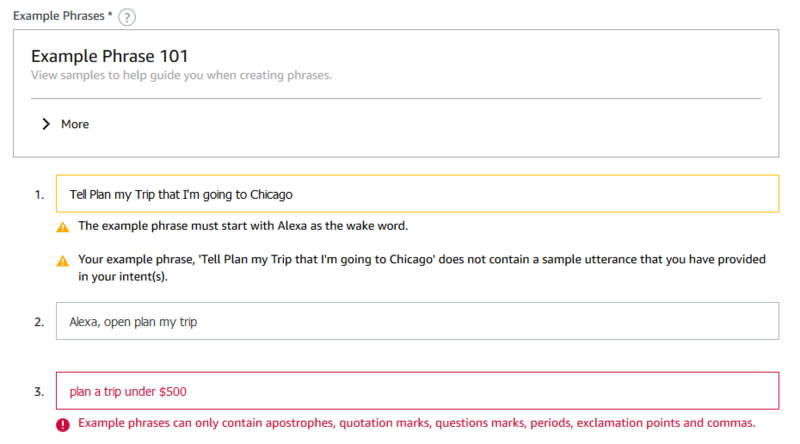 The three example phrases show users what they need to say to begin using your skill. 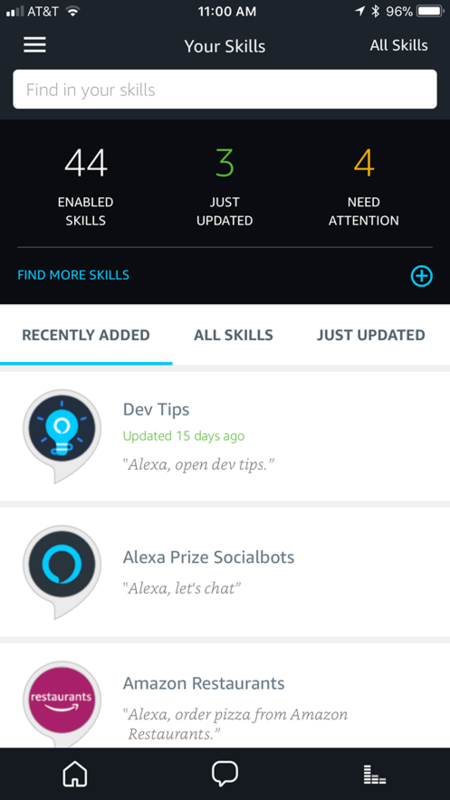 The first phrase is shown in the list of skills in the Alexa App. It is also shown as a "try saying" hint in the account linking flow. All three phrases are displayed prominently on the detail card. If you use utterances for an intent you defined, the phrases must come directly from your sample utterances. Slots in the utterance must be filled in with valid slot values. The phrases must match utterances defined to invoke an intent. User utterances defined to collect slot values as part of a dialog model are not valid as example phrases. If you use utterances for a built-in intent, either use the exact phrase provided in the documentation for the intent or a variation of this phrase. Be sure to fully test the utterance and verify that it works and your skill returns a valid response. If the example utterances you provide fail to return a valid response during certification, your skill will fail certification. Errors are displayed in red text. You cannot submit a skill for certification if any errors exist. Warnings are displayed in black text. Although you can submit a skill with validation warnings, the skill will likely fail certification. It is recommended that you correct any warnings before you submit. In this example, the first phrase generates two warnings: the phrase is missing the wake word, and the phrase does not match any sample utterances. The last phrase generates an error because it contains special characters not allowed in example phrases. Note: If you update the sample utterances for your skill, be sure to build the model before checking your example phrases again. Note that you are not required to include your example phrases within the description for your skill. However, if you do choose to reference them in the description, word the phrase correctly. Include the wake word if your example is intended to show how the user invokes the skill. For more about certification requirements for example phrases, see Functional Testing for a Custom Skill: Review and Test Example Phrases. The Example Phrase 101 section on the Distribution page also provides additional detail and examples for creating good example phrases. Does this skill allow users to make purchases or spend real money? Does this Alexa skill collect users' personal information? Does this skill contain advertising? Verify that your skill meets the Export Compliance requirements. Also fill in any instructions for the testers in the Privacy & Compliance > Testing Instructions field. Be sure to include any information needed to test account linking, permissions, or any special hardware. Note that this information is not shown to users. Public: Publish the skill to the general public. Anyone with an Alexa device can enable and use your skill, provided it is available in their region and language. Alexa for Business Organizations: Publish the skill as a private skill available to just select businesses. For details, see Create and Publish Private Skills. Beta Test: Make the skill available to a set of beta users that you can manage. 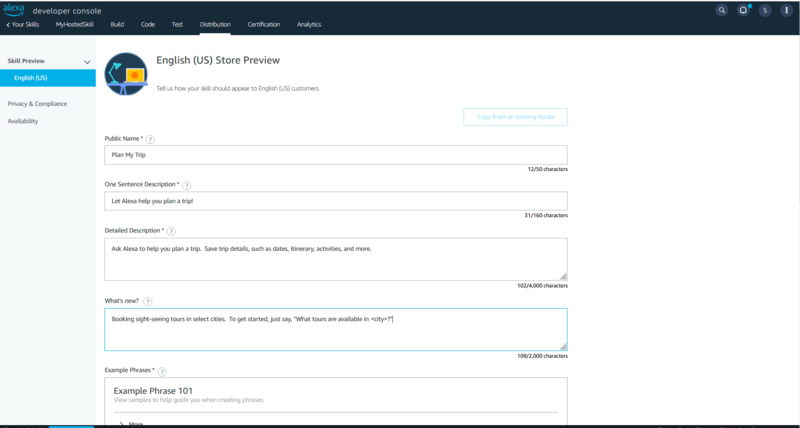 For details about running a beta test, see Skills Beta Testing for Alexa Skills. The skill is distributed in their country or region. The skill supports the language selected for their Alexa-enabled device. A skill must have an English (US) version to be available to customers who registered their devices with the .com site. A skill must have a German version to be available to customers who registered their devices with the .de site. The distribution applies to the skill, not to individual languages. All language versions of the skill are made available to customers in the specified countries and regions, barring content policy restrictions. It is important to remember that customers can choose the language they want to use for their devices, and they are not constrained by their location when choosing the language. For instance, a customer using a .de account can choose to use a different language, such as English (UK), for their Alexa devices. However, changing the language does not affect the skill catalog available to the .de account in the skill store. Therefore, to make a skill available to customers who use .de accounts, you need to include a German version in the skill store. Distributing your skill everywhere Amazon has a presence expands your potential customer and user base. Selecting In all countries and regions where Amazon distributes skills is often the best option unless there is a good reason to limit your skill's availability. When you distribute a skill globally, it is available to users worldwide who have configured their devices to use a language that your skill supports. When you limit the availability of the skill to a particular country or region, it is available just to users in the specified country / region who have configured their devices to use a language that your skill supports. When deciding on your skill's availability, consider whether the skill can be useful to customers in other countries. For example, a trivia game skill can be entertaining regardless of where the user may live, especially if you can add additional languages. In contrast, some skills are useful only in particular geographic areas. A skill that provides food delivery for major US cities, but not in Europe, would not be useful in countries or regions other than the United States. For more about developing skills for multiple languages and countries, see Develop Skills in Multiple Languages.